I'm actually really quite late with this post because these books are all a good 4 months old. :'D Basically, I acquired some awesome books, took and edited some photos, then stuck them in a folder and let it gather dust. It's now out-dated but I figured I might as well share them with you anyway. They're still books, after all. I bought Insurgent in Tesco's one day during the April holidays, without knowing that I would actually be called into school an hour later to get my English reading list. My bag was already quite heavy and Insurgent is quite a big book so I had great fun lugging it around for another 5 hours... I'm haven't actually read it yet but I loved Divergent so I'm looking forward to giving it a go. The Perks Of Being A Wallflower is one of my favourite books and, although I've read it 4 times, I didn't actually have my own copy. I always just steal my sister's. :'D I saw Perks in a charity shop a few months back so I thought I might as well buy my own copy. It's an amazing book so if you haven't already read it, go and get that done. :P Kimberly's Capital Punishment was another charity shop book but I haven't got round to reading it yet. Looks good though! Have you read any of these books? What have you been buying recently? I've read Perks a few times too! I own three copies- 2 paperbacks and the e-book, and I gave away copies of it for World Book Night. This is probably one of my all-time favs! 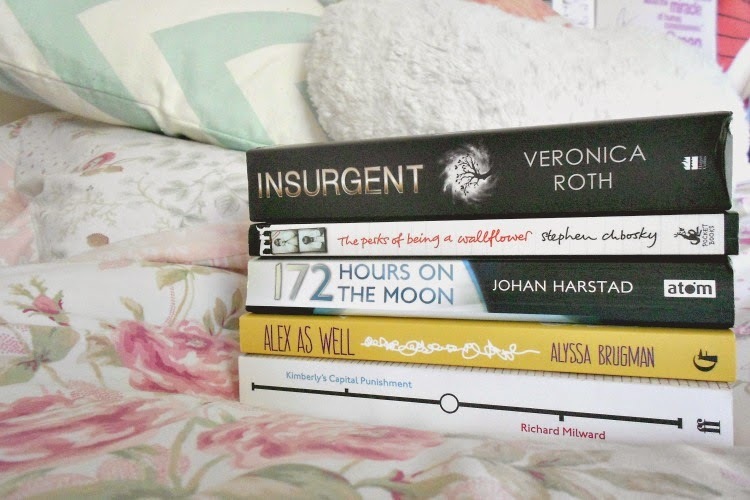 I still haven't read Insurgent though, despite having started it around this time last year! :) Awesome stack of books! I've had a lot of troubles with Insurgent as it's quite different to Divergent - having to put it down a few times here and there - but yesterday I hit the 400 page mark and it's pretty good. 172 Hours was a book that really wasn't for me, so I'm passing it on to Hawwa. I've read Insurgent, which I wasn't very impressed with. I've been meaning to read The Perks of Being A Wallflower ever since I saw the movie, which I really liked. 172 Hours on the Moon was very exciting! Very thrilling and THAT ENDING oh my god. You should definitely read Perks - it's just as good as the film. Ooh Insurgent, I love that trilogy! I recently bought six books secondhand in St Andrews .... I can't stop myself!